Americans love the best. That's why rankings -- of fast food meals, of mustachioed swordsmen, of everything -- matter so much. Responding to that universal truth, the consumer insights firm Market Force Information has just come out with a new study on the top fast-food operations in the nation. After polling 11,000 customers and compiling scores based on satisfaction with food, service, restaurant experience, and other factors, they ranked the top loyalty scorers the following five culinary categories. Some of them will surprise you. Some might call this a contentious, overrated choice, especially those of us who live on the East Coast in unknowing skepticism of In-N-Out's greatness. Nonetheless, Anthony Bourdain loves it, and so did the loyal respondents who gave it a combined score of 79% on this survey. That's not bad considering the burger chain was up against heavy hitters like Five Guys (70%) and Smashburger (58%). On the other hand, Burger King and McDonald's rounded out the very bottom of the category with 41% and 36% overall satisfaction ratings, respectively. 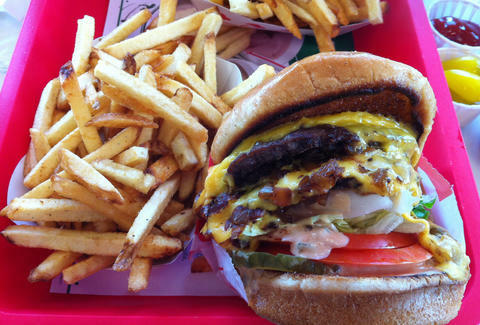 If you happen to be on Team In-N-Out, be sure to check out this follow up ranking of its tastiest secret menu options. Goldilocks 2017: Just right, just right, and just right. Apparently haiku gimmicks involving free burritos and pivoting after a disastrous year involving misleading advertising and E. coli scares paid off. Despite the odds, Chipotle's loyal customers put the chain at the top of their rankings, awarding it a combined score of 57%. That doesn't automatically mean most customers are exactly thrilled though: Moe's Southwest Grill and El Pollo Loco both scored just 55%. For the purposes of this ranking, the American-Mexican fast food game looks like a healthy race right now. If you're still a Chipotle stalwart, whatever you do, don't get the tacos. But don't miss out on all the secret ways to hack your burrito either. Our Chicken Florentine is guaranteed to satisfy your taste buds. Available at participating locations. With 700 stores against 15,000, Marco's may not enjoy the same deep market penetration Pizza Hut does, but the pizza chain annihilated the elephantine competition with a 75% loyalty rating from customers across the nation. This makes sense given that Pizza Hut was at the bottom of a list that also included Little Caesars and CiCi's, and all those spots, by comparison, do not make great pizza. When it comes to customer loyalty, Chick-Fil-A reigns supreme at 78%. It also dominated all the other chicken spots in every category except for, errr, healthy options. In that category El Pollo Loco beat it by one percentage point, 57% to 56%. If you're ordering a fried chicken sandwich, though, who's doing it for health reasons exactly? Faced with stiff competition from the likes of Panera Bread and McAlister's Deli, the firefighter-founded Firehouse Subs got a loyalty score of 77%. The popular chains Arby's, Jimmy Johns, and Subway rounded out the bottom rung.